I am guilty of neglecting my blog this summer. It started with our annual trip to Galveston. It has been around or over the 100 degree mark in Central Texas since the middle of June. When we arrived in Galveston it was in the 80's. This was our first time to visit the island since Ike. I'm actually impressed with how quickly they have gotten the island back together. I am also awed by the power of a hurricane. The sand dunes are gone and the beach we go to is full of new sand bars much closer to the shore. When the tide is out there are lots of tidal pools that the kids had a blast playing in. 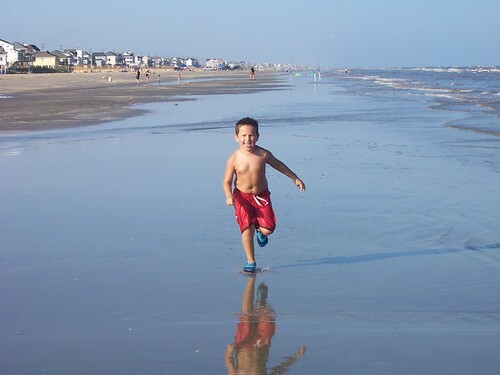 My brother, Caleb, came to the beach with us. We were back for three days and then drove to Missouri to visit Grandma and Grandpa. Before I left for the beach I did manage to finish a Father's Day gift for my dad. 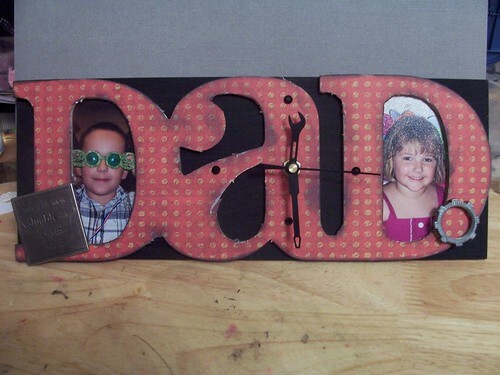 This clock is from Kaiser Crafts. They have really unique and fun books and 3-D items to finish. They're products are also reasonably prices. The paper is by rusty pickle and the embellishments were pulled out of my stash.